Pets! Dogs, cats, fish, birds, rabbits, maybe even a reptile that takes a certain kind of love, regardless, they are pets and they are loved. Both of us have experienced owning a dog and a cat. These furry fun loving animals have become parts of our family, and very important ones at that! For us, our dog has and always will be our first baby. The amount of joy he has brought into our lives is amazing. No matter how bad of a day we could be having we are never greeted by anything less than him carrying around two, sometimes even three, toys in his mouth at a time. His tail going a mile a minute and him hitting everything in his path to get to us. His endless kisses and big smile (yes we swear he smiles). The great part is, even if we leave for a half an hour to go up the street to the farmers market, we are still greeted like this every time we return. Our dog knows he is a part of the family and we never want that to change. Even now with being new parents, we make sure that he doesn't feel excluded and that he is still a big part of our attention. 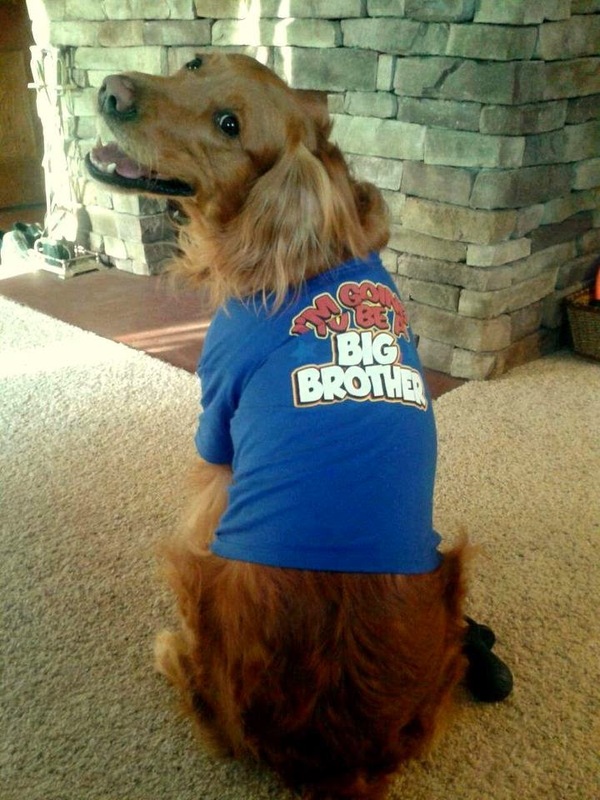 After all he has a big responsibility to fill, he is the big brother! Thankfully he has taken on that role very well. It is even more rewarding to see the two of them interact together. Now that our little man is getting bigger and noticing things more, his biggest source of entrainment is his big brother. He is now giggling at him and loves to try and catch his tail. We know that once our little man can run around and chase him, their bond will continue to grow. It's so true when people told us if you want to practice your parenting skills start with a dog. We think that raising him from just 8 weeks old helped tremendously with getting acclimated to parenthood. Of course it's on a much different spectrum and something's are similar where others are not, but none of the less, he was and always will be our first baby. Cats may be different in personality and the type of affection they give, but these fun loving animals have also brought so much joy. Their playful spirit and sassy personality bring many smiles and moments of laughter. Cats seem to have a way of sensing things and really being able to pick up on the moods around them. The special snuggle moments and head rubs are something both you and them cherish. Cats have a way of getting into things or hiding in places that will make you laugh and shake your head, often in wonder and amazement at how did they get into that? Our cat was an alley cat but very affectionate. When we first saw him his one eye was barely open, his hair on his head was falling out and he was so skinny his ribs were popping out. We fed him every day and gave him water. He would come running out from where ever he was as soon as he heard my keys jingle. Then within a few weeks his hair was growing in, and it was so soft, we finally saw his eyes open and they were these big green yellow beautiful eyes. He was eating well and his ribs were no longer showing. Then it got to a point where we would let him in our apartment, only for an hour or so, but over time he became attached to me and I to him. That hour turned into a few hours and then a few into him sleeping over. We are hoping that anyone who has a pet can relate to this post and share in the joy and excitement they have brought into our lives. "Pets come into our lives and leave paw prints on our heart"